In the 17th century, a secretive group of Capuchin Monks went into graveyards with shovels. They dug up thousands of former friars. Sometimes, they took skulls. Other times, they took feet, hands, ribs or vertebrae. They also took entire bodies. Then they decorated the dusty basement of their church, Santa Maria della Concezione, with the bones of their brethren. It’s fascinating and horrific. But on the floor there’s a message revealing why the monks did it. We can’t recover time. Unlike money, once we spend it, we can’t get it back. Unfortunately, technology might be stealing our irrecoverable sands of time. In 2016 The New York Times reported that Facebook’s average user spent 50 minutes a day on the social media site. That means the average person spent one-sixteenth of their waking time on Facebook. According to the Bureau of Labor Statistics, that’s more time than we spend reading. It’s more time than we spend exercising. It’s even more than we spend socializing in person. But that was in 2016. According to Statistica.com, every year we spend more time on social media. In 2012, the average user spent 90 minutes a day on social media sites. By 2017, such time had increased to 135 minutes. Let’s put this in perspective. There are 24 hours in a day. If somebody sleeps 8 hours a night, that leaves 16 hours of time awake. If the typical person spends 135 minutes on social media, that’s 14 percent of their day. But here’s where the math gets creepy. Assume a life expectancy of 78 years. If a person averaged 135 minutes a day on social media sites that would total 7.31 years of their life. I’m not against social media. As the Greek philosopher, Heraclitis, once said: “Change alone is unchanging.” We can’t turn back to a pre-Internet age. Nor would most of us want to. But social media platforms are designed to be addictive. 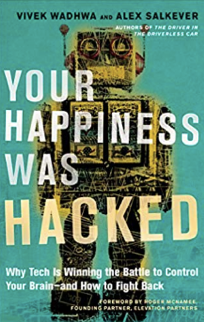 Vivek Wadhwa and Alex Salkever recently published the book, Your Happiness Was Hacked: Why Technology is Winning the Battle to Control Your Brain–and How to Fight Back. They refer to FOMO (The Fear of Missing Out) and how it leads to unproductive behavior. The authors say the average adult checks their emails 72 times during a workday. University of California researcher, Gloria Mark, says we check email at work 77 times a day. Consequently, many people lose focus at work. Many of them bring their work home to meet work-related deadlines. That’s time they’re spending away from friends and family. Email addictions cost time that we can’t replace. Trevor Haynes is a research technician in the Department of Neurobiology at Harvard Medical School. In March 2018, he published Dopamine, Smartphones and You: A Battle for your time. He says people get addicted to social media approval. For example, every time people click “like” or comment on our pictures or posts, it triggers dopamine in our brains. Addiction soon follows. Think back to the first time you posted something on social media. When somebody else responded, you might have been amused. But over time, responses to your posts could have triggered addictive cravings. Unfortunately, social media and computer screens have a direct effect on sleep. Harvard University researchers Anne-Marie Chang, Daniel Aeschbach, Jeanne F. Duffy, and Charles A. Czeisler published relative research in 2014. They learned that using an iPad to read at night before going to sleep reduced the production of melatonin by 55 percent. Melatonin helps us sleep. Its production also fights cancer. A few years ago, I taught a high school personal finance class in Singapore. I asked my students, “How many of you go to bed with your phones?” Almost all of them said they did. I then asked how many of them answer calls or texts in the middle of the night. Once again, most of the hands shot up. BBC News reported a study in 2016. They asked 2,750 teenagers in the United Kingdom similar questions. The researchers learned that 45 percent of the teens checked their smartphones while they should have been sleeping. Forty-two percent of the teens slept with their phones. Despite writing this, I want to make something clear: I’m a social media addict. I try to control my addiction by limiting WiFi access. I’ve never carried a phone with access to WiFi. If I did, I might be a social mess. Like so many others, I’m critical when couples in restaurants have their faces in their phones. I’m critical of people in public settings that don’t look around. I’m critical of people who would rather text than speak to a real person.